Scientists from NASA and two universities presented new results dedicated to this task in fields spanning astrophysics, Earth science, heliophysics and planetary science—demonstrating how a cross-disciplinary approach is essential to finding life on other worlds—at the fall meeting of the American Geophysical Union on Dec. 13, 2017, in New Orleans, Louisiana. "The potentially habitable real estate in the universe has greatly expanded," said Giada Arney, an astrobiologist at NASA's Goddard Space Flight Center in Greenbelt, Maryland. "We now know of thousands of exoplanets, but what we know about them is limited because we can't yet see them directly." 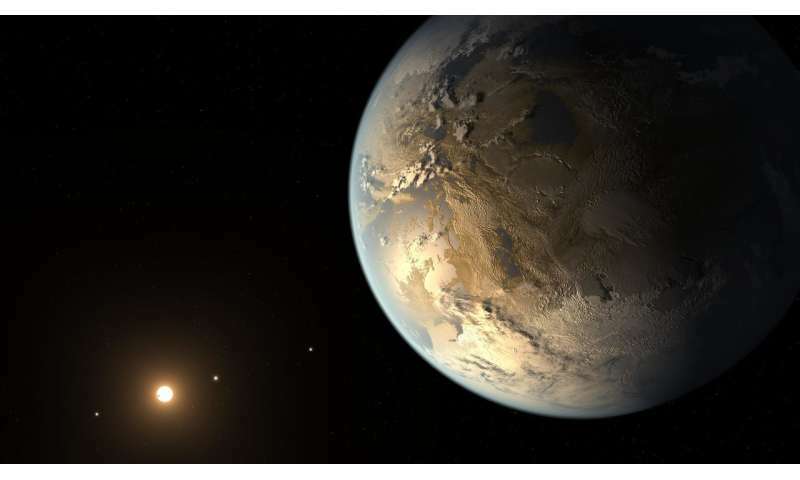 Currently, scientists mostly rely on indirect methods to identify and study exoplanets; such methods can tell them whether a planet is Earth-like or how close it is to its parent star. But this isn't yet enough to say whether a planet is truly habitable, or suitable for life—for this, scientists must ultimately be able to observe exoplanets directly. Direct-imaging instrument and mission designs are underway, but in the meantime, Arney explained, scientists are making progress with tools already at their disposal. They are building computational models to simulate what habitable planets might look like and how they would interact with their parent stars. To validate their models, they are looking to planets within our own solar system, as analogs for the exoplanets we may one day discover. This, of course, includes Earth itself—the planet we know best, and the only one we know of yet that is habitable. "In our quest for life on other worlds, it is important for scientists to consider exoplanets from a holistic sense—that is, from the perspective of multiple disciplines," Arney said. "We need these multi-disciplinary studies to examine exoplanets as the complex worlds shaped by multiple astrophysical, planetary and stellar processes, rather than just distant points in the sky." Stephen Kane, an exoplanets expert at the University of California, Riverside, has come up with one way to answer that question using NASA's Earth Polychromatic Imaging Camera aboard the National Oceanic and Atmospheric Administration's Deep Space Climate Observatory, or DSCOVR. 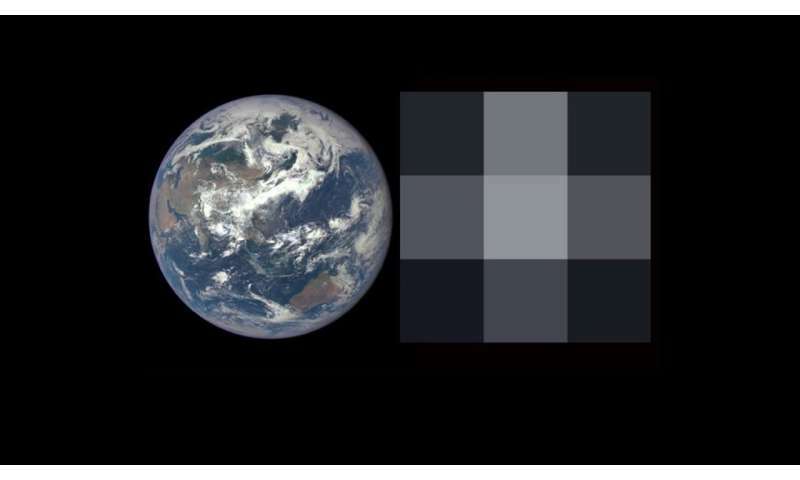 Kane explained that he and his colleagues take DSCOVR's high-resolution images—typically used to document Earth's global weather patterns and other climate-related events—and degrade them down to images just a few pixels in size. Kane runs the DSCOVR images through a noise filter that attempts to simulate the interference expected from an exoplanet mission. "From just a handful of pixels, we try to extract as much information that we know about Earth as we can," Kane said. "If we can do it accurately for Earth, we can do this for planets around other stars." DSCOVR takes a picture every half hour and it's been in orbit for two years. Its more than 30,000 images are by far the longest continuous record of full-disk observations from space in existence. By observing how the brightness of Earth changes when mostly land is in view compared with mostly water, Kane has been able to reverse-engineer Earth's albedo, obliquity, rotation rate and even seasonal variation—something that has yet to be measured directly for exoplanets—all of which could potentially influence a planet's ability to support life. Much the way scientists use Earth as a case-study for habitable planets, they also use planets within the solar system—and therefore planets they are more familiar with—as studies for what makes planets uninhabitable. Kane also studies Earth's sister planet, Venus, where the surface is 850 degrees Fahrenheit and the atmosphere—filled with sulfuric acid—bogs down on the surface with 90 times the pressure of Earth's. Since Earth and Venus are so close in size and yet so different in terms of their prospects for habitability, he is interested in developing methods for distinguishing Earth- and Venus-analogs in other planetary systems, as a way of identifying potentially habitable terrestrial planets. Kane explained that he works to identify Venus analogs in data from NASA's Kepler by defining the "Venus Zone," where planetary insolation—how much light a given planet receives from its host star—plays a key role in atmospheric erosion and greenhouse gas cycles. 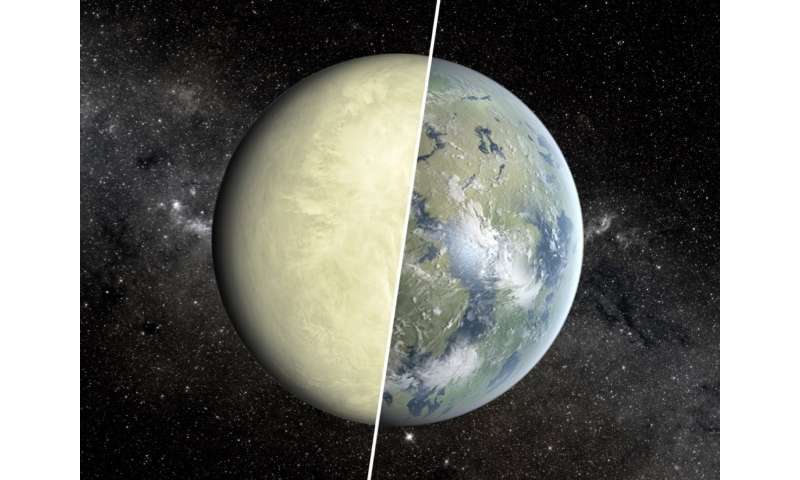 "The fate of Earth and Venus and their atmospheres are tied to each other," Kane said. "By searching for similar planets, we are trying to understand their evolution, and ultimately how often developing planets end up a Venus-like hellscape." While Kane talked about planets, Goddard space scientist Katherine Garcia-Sage focused on the way planets interact with their host star. 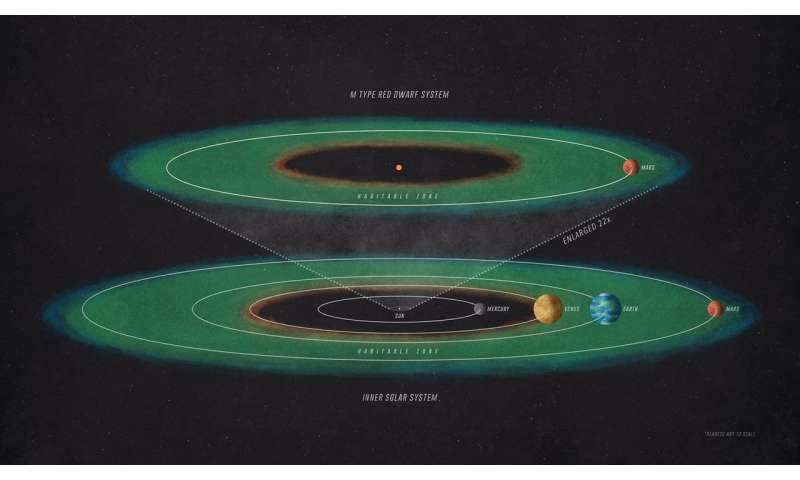 Scientists must also consider how the qualities of a host star and a planet's electromagnetic environment—which can shield it from harsh stellar radiation—either hinder or help habitability. Earth's magnetic field, for example, protects the atmosphere from the harsh solar wind, the Sun's constant outpouring of charged solar material, which can strip away atmospheric gases in a process called ionospheric escape. Garcia-Sage described research on Proxima b, an exoplanet that is four light-years away and known to exist within the habitable zone of its red dwarf star, Proxima Centauri. But just because it's in the habitable zone—the right distance from a star where water could pool on a planet's surface—doesn't necessarily mean it's habitable. While scientists can't yet tell whether Proxima b is magnetized, they can use computational models to simulate how well an Earth-like magnetic field would protect its atmosphere at the exoplanet's close orbit to Proxima Centauri, which frequently produces violent stellar storms. The effects of such storms on a given planet's space environment are collectively known as space weather. "We need to understand a planet's space weather environment to understand whether a planet is habitable," Garcia-Sage said. "If the star is too active, it can endanger an atmosphere, which is necessary for providing liquid water. But there's a fine line: There is some indication that radiation from a star can produce building blocks for life." A red dwarf star—one of the most common types of stars in our galaxy—like Proxima Centauri strips away atmosphere when extreme ultraviolet radiation ionizes atmospheric gases, producing a swath of electrically charged particles that can stream out into space along magnetic field lines. The scientists calculated how much radiation Proxima Centauri produces on average, based on observations from NASA's Chandra X-ray Observatory. At Proxima b's orbit, the scientists found their Earth-like planet encountered bouts of extreme ultraviolet radiation hundreds of times greater than Earth does from the Sun. Garcia-Sage and her colleagues designed a computer model to study whether an Earth-like planet—with Earth's atmosphere, magnetic field and gravity—in Proxima b's orbit could hold on to its atmosphere. They examined three factors that drive ionospheric escape: stellar radiation, temperature of the neutral atmosphere, and size of the polar cap, the region over which the escape happens. The scientists show that with the extreme conditions likely to exist at Proxima b, the planet could lose an amount equivalent to the entirety of Earth's atmosphere in 100 million years—just a fraction of Proxima b's 4 billion years thus far. Even in the best-case scenario, that much mass escapes over 2 billion years, well within the planet's lifetime. While Garcia-Sage spoke of magnetized planets, David Brain, planetary scientist at the University of Colorado, Boulder, spoke of Mars—a planet without a magnetic field. "Mars is a great laboratory for thinking about exoplanets," Brain said. "We can use Mars to help constrain our thinking about a variety of rocky exoplanets where we don't have observations yet." Brain's research uses observations from NASA's Mars Atmosphere and Volatile Evolution, or MAVEN, mission to ask the question: How would Mars have evolved if it were orbiting a different kind of star? The answer provides information for how rocky planets—not unlike our own—could develop differently in different situations. It is thought that Mars once carried water and an atmosphere that might have made it hospitable to Earth-like life. But Mars lost much of its atmosphere over time through a variety of chemical and physical processes—MAVEN has observed similar atmospheric loss on the planet since its launch in late 2013. Brain, a MAVEN co-investigator, and his colleagues applied MAVEN's insights to a hypothetical simulation of a Mars-like planet orbiting an M-class star—commonly known as a red dwarf star. In this imaginary situation, the planet would receive about five to 10 times more ultraviolet radiation than the real Mars does, which in turn speeds up atmospheric escape to much higher rates. Their calculations indicate that the planet's atmosphere could lose three to five times as many charged particles and about five to 10 times more neutral particles. "But I wouldn't give up hope for rocky planets orbiting M dwarfs," Brain said. "We picked a worst-case scenario. Mars is a small planet, and lacks a magnetic field so solar wind can more effectively strip away its atmosphere. We also picked a Mars that isn't geologically active, so there's no internal source of atmosphere. If you changed any one factor, such a planet might be a happier place." Each one of these studies contributes just one piece to a much larger puzzle—to determine what characteristics we should look for, and need to recognize, in the search for a planet that might support life. Together, such interdisciplinary research lays the groundwork to ensure that, as new missions to observe exoplanets more clearly are developed, we'll be ready to determine if they might just host life.